Although the National Trust is best known for its grand stately homes, it is also the guardian of much of Britain's scenic coastline. 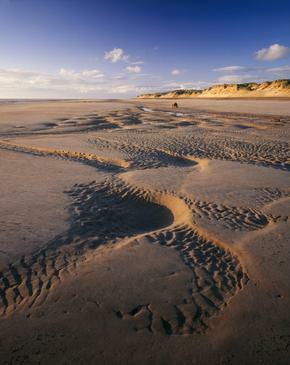 One such specially protected area is Formby Beach, near Southport. 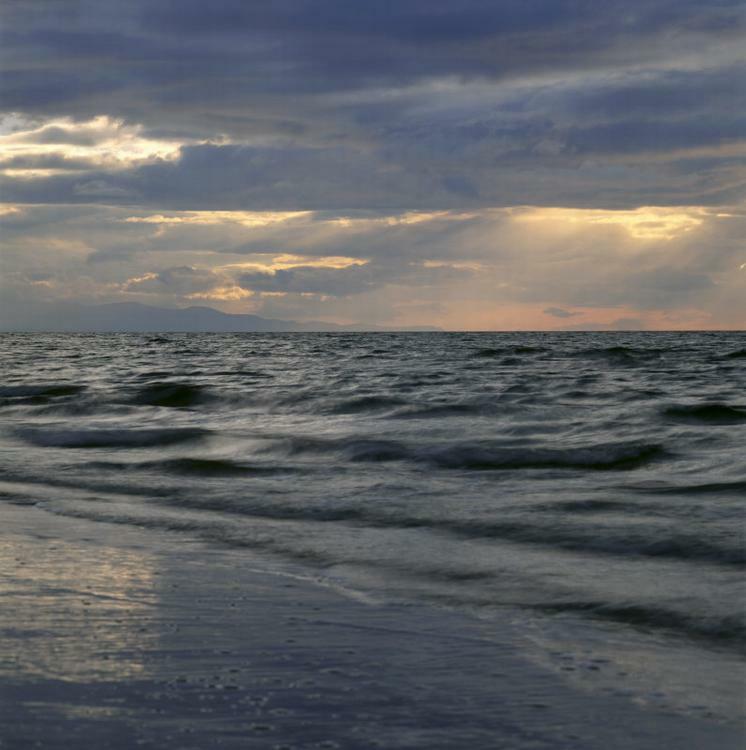 It comprises 500 acres of sand dunes, backed by attractive pine woods. 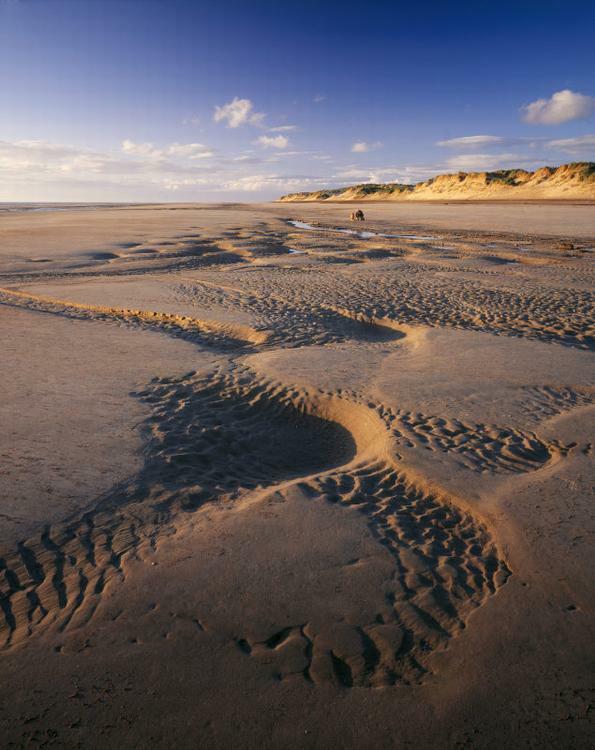 The sand dunes were formed as the Crosby Channel gradually silted up and the sea receded. It is now home to many unusual plants, many due to spillages of grain cargoes at the nearby Liverpool docks which washed up here and took root. As well as the surprising greenery, the area is a natural habitat for many birds such as oyster catchers, bar-tailed godwits, dunlins and sanderlings which feed at the water's edge of this nature reserve. The pine woods around Formby Point are home to one of England's last remaining colonies of native red squirrels. They are almost extinct outside Scotland after the introduction of the American grey squirrel that carries a virus which is deadly to the red squirrel.Formby Beach is a popular local beauty spot for family picnics, walks along the sands, nature discoveries and exploring the waymarked paths through the woods and dunes. Circular routes include a 3 mile saunter starting at the Freshfield Railway Station and heading through the Red Squirrel Reserve before striking out along the beach to Mad Wharf and Formby Point. Return over the grassy path to the manmade lake with its ducks, swans and small bridge and then head northwards along Larkhill Lane back to Freshfield Station. Other walks are available on maps from the Warden's Office. One particularly interesting sight along the beach are the animal and human footprints baked in the mud beneath the sand which date back to prehistoric times. The coastal erosion has led to these ancient layers being stripped away to reveal historic evidence of our predecessors at this important archaeological site. 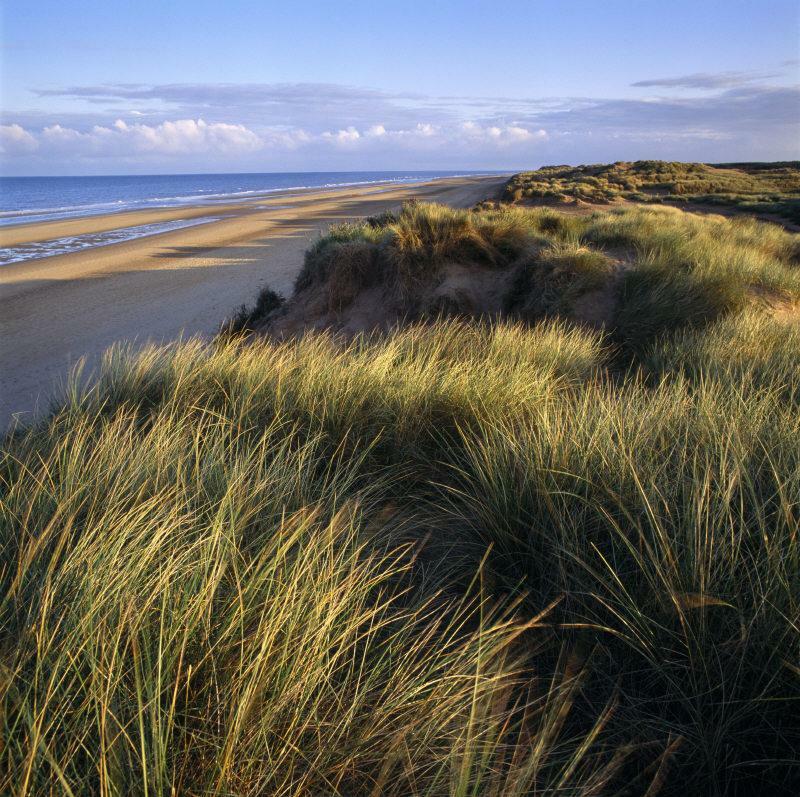 The high sand dunes are a designated Site of Special Scientific Interest and provide excellent views on a clear day of the Cumbrian Mountains to the north and the Irish Sea to the west. Here insects and lizards may be seen, and the rare natterjack toads may be heard when they make a rousing chorus of noisy croaks at dusk. Along the water's edge numerous tiny crabs can be seen scuttling in and out of their sandy burrows. Jellyfish and sea shells are left at the water's edge and tiny fish eggs in their thousands make tasty pickings for gulls and other wading birds. With such a diverse range of habitats and so much wildlife to experience, a visit to Formby Beach is an ideal family trip at any time of year. 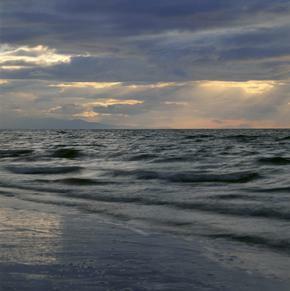 Beaches and Countryside: Open Dawn until Dusk. Car Parks: 9am to 5:30pm in summer, and 4:30pm in winter. An annual permit is available. Sefton Coastal Path runs from Crosby in the south to Crossens (north of Southport) in the north and cuts right through the property. There are rail stations along the route with various points of entry. National Cycle Route 62 runs within 3 miles of the property at Ainsdale, from here you can follow on-road routes to Formby. Please note, these roads can be busy at times and access to the property is via a busy dual carriageway. For more information visit Sustrans. Arriva 48A, Southport to Formby, frequent service. Alight at Cross Green, then 5 minute walk to Formby. Cumfy Coaches 160/1/4, Formby station to Freshfield station. Alight end of Harrington Road/Victoria Road, then 10 minute walk to Formby. For more information visit traveline. Frequent services from Liverpool and Southport stations to Freshfield station, then ½ mile walk, along pavements, to the entrance of Formby, or 1 mile to Formby beach. For more information visit Transport Direct. M62 then M57, or M6 then M58. Follow signs for Southport and central attractions (A565), heading north on the dual carriageway. Continue straight over the 1st roundabout (ignoring the sign for Formby). At the traffic lights, which are at a crossroads, take a left into Formby and follow the National Trust brown signs. From Southport follow the A565, head south on the dual carriageway, turn right at the BP roundabout and then pick up National Trust signs. Accessed from Victoria Road entrance. Please note this car park gets congested at peak times, property is in close proximity to Freshfield train station. Width restriction 3 yards.